Looking for affordable, fashionable clothing for babies, children and teens? Base Fashion is at the forefront of young fashion offering practical and stylish clothing for kids of all ages. And with a Base Fashion discount code, you can update their wardrobes without spending a fortune. Whether you've got a fast-growing adolescent or a fussy teenager, Base Fashion discount codes will help you save money on all the essentials as well as designer clothing, gifts, swimwear and more. Base Fashion is a brand steeped in history and heritage. Starting life as Granditer's, a clothing store in London's vibrant East End, in 1910, the Granditer family continued to supply clothing to the capital's fashion-conscious citizens throughout two world wars and the Great Depression. The original founder, along with two of his sons, expanded and developed Granidter's throughout the 50s and 60s, transforming it into the fashion supplier of choice throughout East London and Essex. Now known as Base Fashion, the brand benefits from over 100 years of experience in the clothing industry, operating six stores throughout the South East as well as a successful online store. Still a family business, Base Fashion is owned by the fourth generation of the Granditer family and takes pride in its non-corporate attitude and authentic East End roots. Having seen fashions come and go and come again over the years, the company is dedicated to supplying its customers with quality, stylish and fashionable clothing that stands the test of time. Considered one of the UK's leading retailers of childrens' designer clothing for boys and girls from newborn to 16 years, Base Fashion is at the forefront of modern fashion, with a team of buyers working tirelessly to to put together the best selection of kids clothing and footwear from top designer brands such as Ralph Lauren polo, Mayoral, Levis, Armani Junior and Boss. The site also stocks key high street brands with an urban cutting edge – perfect for teenage boys – with items from Voi Jeans, Criminal Damage, UCLA and more. Base Fashion also stocks an extensive range of baby clothing, perfect for new mums and dads that want their new arrivals to look their very best without resorting to the typical pink and blue cliches. Practical and stylish, Base Fashion's baby range boasts items from top brans like Kissy Kissy, Armani baby, Rockstar Baby and more. Want to get shopping with Base Fashion? With a Base Fashion discount code you can get your kids' wardrobes completely up to date without breaking the bank. Whether you need to get your teenagers kitted out for a new school term or you want to make sure your newborn looks as cute and stylish as possible, Base Fashion discount codes will help you save money while you shop. 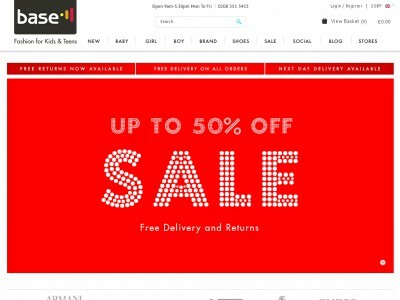 Browse our website until you find a Base Fashion discount code that suits you, then navigate to their website to begin shopping. When you're finished shopping, click 'View basket. Enter your Base Fashion discount code in the box provided and click 'Apply'. Standard UK delivery is free on all orders, with options for Next Day and Nominated Day deliveries for a small fee. If you need to return a product for any reason to Base Fashion, you can do so by emailing returns@basefashion.co.uk and following the simple instructions. Want to stay up to date with everything that's happening at Base Fashion? Why not follow the company across all your favourite social media platforms? You'll enjoy news, features, competitions and more, plus the chance to save money with a Base Fashion voucher code. Don’t forget to check them regularly, as you can never be sure when free Base Fashion discount codes might be waiting for you! Buy now online at www.basefashion.co.uk. If you’re looking to get your child into some serious top of the line designer clothes, then Basefashion.co.uk could be the solution to all your problems. Not only that that, but you can also use a Base Fashion discount code to get great discounts when shopping there. A Base Fashion voucher code can be used to significantly discount one or multiple items when shopping, and since Base Fashion discount codes are free to use, you can guarantee that every day is a sale day! So the next time you shop, be sure to grab your Best Fashion discount code!